Shelf(ie) Light in deep black. Can be used to mount to the wall or as a table lamp. Put your precious photos, books or accessories on the shelf and it certainly will catch eyes! 40cm height and 27cm wide(base of shelf measurement). The shelfie light is as cool a cucumber – a perfect combination of design and functionality. Even turned off it’s doing its design thing! The light beam forms the shelf which can be wall mounted or can free-stand on a table or desk. Brighten up your shelfie stuff with this intriguing accessory. Meterial: Shade – High gloss finished polycarbonate. 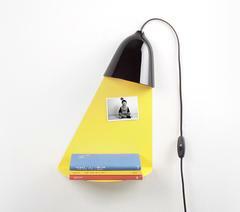 Shelf (light beam) – Powder coated steel.